Procrastination is my best friend, but just how many months has it been? I’ve finally put together the missing finishing touches to my final Taeyang Quarterly commentary. This time, I’m looking at entries from challenge three, “Twisted Fairy Tale”, challenge four, “Passion”, and challenge five, “Masterpiece”. As with my prior Taeyang Quarterly commentary, all photos appearing on this page are used with permission. Out of 25 contestants, 23 submitted entries to this challenge. “Cinderella” and “Rapunzel” weighed in at five photos each, “Sleeping Beauty” took three, two each went to “The Elves and the Shoemaker”, “Rumpelstiltskin”, and “Snow White”. Finishing up with one photo each (and probably scoring highest in the originality scoring category) at “Bluebeard”, “Hansel and Gretel”, “Little Red Riding Hood”, and “The 3 Little Pigs”. Seeing so many “Rapunzel” entries took me by surprise. Maybe it’s because I have more familiarity with the stories behind all of the other entries, save for “Sleeping Beauty” and “Bluebeard” (which I had never heard of before). Maybe it’s because “Rapunzel” has always seemed like a weak story to me (as is the case for many of fairy tales). It’s a story which simply doesn’t register with me, so seeing its popularity came as unexpected. I figured “Cinderella” and “Snow White” would tie at the top for use. Could it be that some people thought “Rapunzel” would be a less commonly used theme? 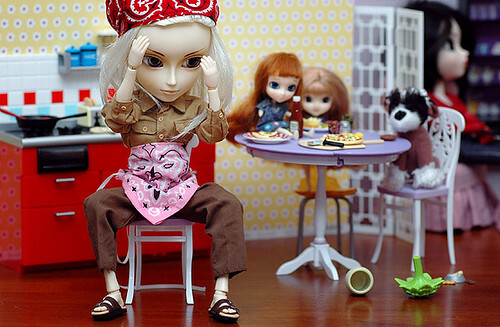 Perhaps Pullip having a 1/3 head on a 1/6 body has simply resulted in many Pullips having Rapunzel-length hair. I can only imagine the difficulty yukittie faced in trying to her Shiryo and Damien both in the camera’s viewfinder with Shiryo as Rapunzel falling from the castle tower by Prince Damien’s weight. yukittie achieved the scene well with a portrait orientation. 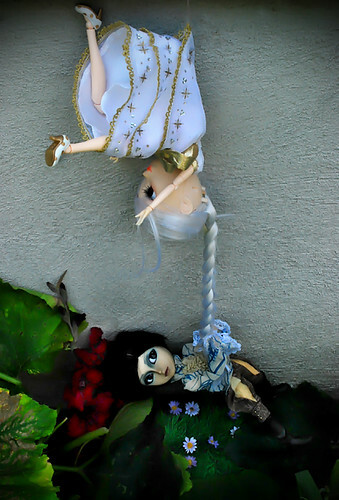 While the angle and height of the camera, and location of the dolls, could be played with to improve the scene, for a competition entry, this achieves the desired look and portrayal of a fairy tale twist. The only issue I’d bring up in a conversation would the be vignetting along the top corners, the dark area, which could be avoided by stepping back, taking a picture of a wider area, and then cropping the extra area on the top and sides off. I’d give the coveted “Rapunzel Humor Award” to hera_and_kira, as Gabriel begins his climb, only to have Rapunzel’s wig pull right off. Considering all the Pullips hera_and_kira has available (many seen in her prior challenge entry), Ellie was a good choice, as her blue eyes as a Shinku Pullip contrast well with her surrounds. grotesqa presents her scene using an idea I’ve considered, but would have done no where near as good with: speech balloons. Showing a still photograph of a scene from a fairy tale is easy enough if the viewers are familiar with the source material, but putting a twist to it becomes difficult to convey without an explanation. Here, Cayenne and Vivienne are able to act out a scene without requiring an explanation because their words are included. I’d like to hand grotesqa the “Rapunzel Creativity Award”. This photograph also does well to show the scene using minimal props to create a convincing setting, including the bare necessity elements, and keeping the viewer’s attention on the event portrayed. There’s a saying, “You snooze, you lose,” but telling that to Sleeping Beauty’s Aurora and you’ll probably hear otherwise. CornflowerBlue‘s composition does a good job to put three subjects into the seen, and the background pulls together the feel of the location. My only wish would be for the prince to be more in focus, as he’s a key player in the scene. I wondered whether moeeeh‘s entry would make it, as its twist looks to take place after the “happily ever after” portion of the fairy tale. The composition gives all the elements the right amount of attention, with Snow White doing her own thing off in the background, and Prince Luka coming to terms with his future of cooking and cleaning. Maybe it’s about time the prince loosened his wallet and hired a maid? Without a doubt, ccbychlaz‘s entry has the most elaborate set-up, and worthy of the “Rumpelstiltskin Elaborate Scenery and Props Award”. The composition is flawles, and the lighting sets the mood. I had to check the results a few times before I could believe ccbychlaz didn’t move onto the next round. Using the same fairy tale was kaoko_cow, with Wills in the same gold-spinning role. With Yuujiroustiltskin requesting the maiden’s daughter be his own, and Willstiltskin spinning gold from a source other than straw, one can only determine the latter’s twist was stronger than the former’s. At first glance, “passion” sounds like a simple theme. After a moment’s thought, it quickly becomes clear that an original idea while still conveying passion is a lot more difficult. This theme had a great turnout with many wonderful entires. It’s hard not to think, “I wish I thought of that!” while looking over some of the 15 entries. The most obvious idea is probably a boy/girl pairing, making it clearly an unoriginal idea. In a twist of irony, this concept has been avoided so much that it stands as an “original” idea. Better yet, for those who went with this take on the theme, no two ideas came close to being similar. nuwandalice‘s prior entry was self-admittedly a last-minute rush, and it really showed. Her Passion entry, on the other hand, has more time and thought put into it, with care put into the set-up, good lighting was available, and the composition is perfect. Down to the details, such as Pip’s casual attire with inclusion of a tie, and Arien’s over-sized sweater; the way the two look at one another; and the newspaper held over their heads; everything pulls together to produce a good feeling. Being able to make good use of an existing location is a good skill to work on, and yukittie entry does just that. This isn’t a first, considering Damien’s second challenge appearance (as Adam) also made good use of location. This time around, the passionate gardener appears, amidst soil and flowers. With a setting like this, the first challenge is simply to find the right area. With that taken care of, yukittie clearly paid attention to detail. 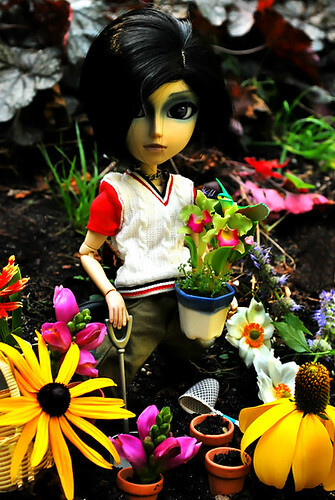 From the potted plants to the shovel in Damien’s hand to the bug-catching net on the ground, yukittie has achieved a sense of realism that isn’t always easy to convey in a doll photograph. 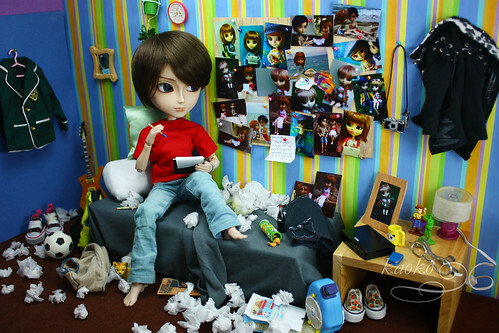 Another elaborate scene is moeeeh‘s setting, with a Pokémon-obsessed Luka. 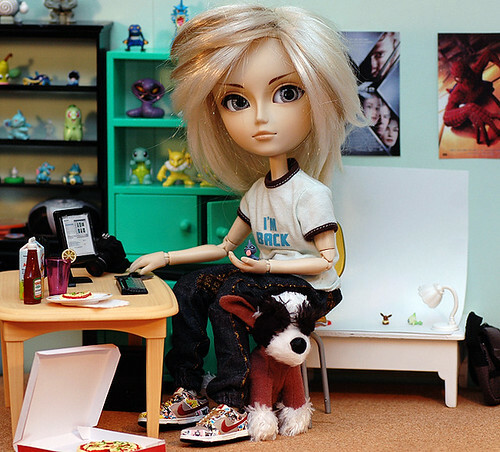 Shelves of Pokémon figures, a Pokémon figure in his hand, a macro photo set-up with a couple more Pokémon figures, and the computer with what may be photograph thumbnails on the scene make Luka’s passion very clear. My only wishes for this photo would be to replace the X-Men and Spiderman movie posters with Pokémon posters, and to remove the slight tilt to the photograph. Regardless of these minor nitpicks, moeeeh’s entry is superb, although it does leave me wondering if Luka puts ketchup on his pizza. ochiva knows how to put a scene together, and Raven’s latest appearance doesn’t disappoint. 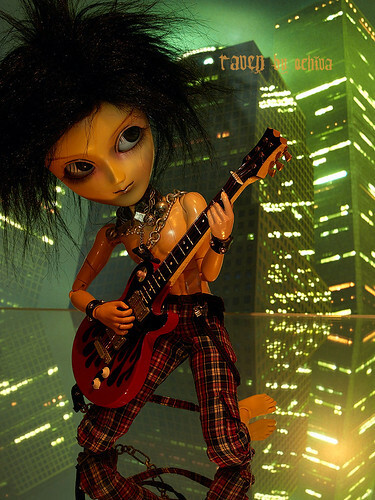 I don’t know what kind of body Raven has, but those hands work perfectly for holding the guitar. Using a mirror for the ground and a computer monitor to provide the background (something I’ve never been able to do successfully) has created a very strong atmosphere, Raven’s dynamic pose gives the photograph life. Between this and prior entries, it’s easy to see how ochiva made to the final challenge. The final challenge put on the pressure to present for the three finalist entries. The entrants each came up with interesting ideas, with Lucian’s masterpiece wife in the making, and the monster of Dr. Wilistein hard at work. 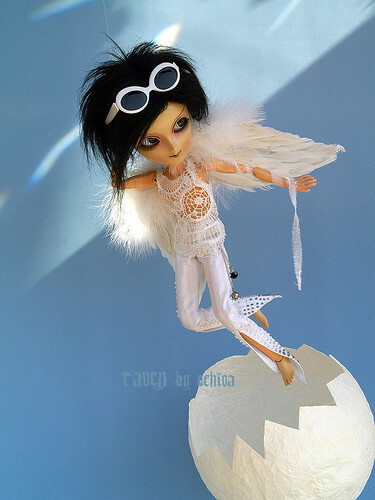 It’s understandable why Raven’s angelic hatching would win. It takes simplicity and flies with it. I can nitpick minor details (such as too close a crop of the egg on the right), but pose and angle are well chosen. This is one of those rare photos were centering the subject works, and placing Raven higher up in the frame has given the feel of rising from the egg. Congratulations to everyone who participated in Taeyang Quarterly (and those who took place in Dalicious as well). Photography competitions can be a lot of work, but they offer rewards in proportion to the time and effort invested in them.